The kids and I got to check out Boyne Highlands, in Northern Michigan. A decent drive from Toronto (approximately 7 hours) the resort is a lot of fun. 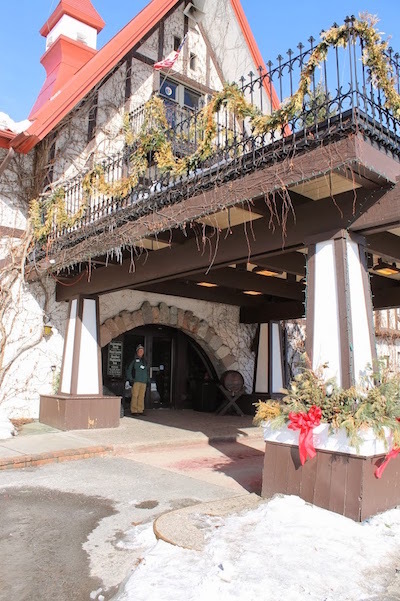 The hotel itself could use a little love but there’s a lot of reasons to check out Boyne. As I have previously posted photos of the main hotel at Boyne Highlands, I will skip reviewing the property but will say that I quickly visited Boyne Mountain (30 minute drive from the Highlands) and saw vast improvements on that property including the Mountain Grand Lodge and Spa, a newer and modern hotel. The Highlands is at best what I think of as a 3 star hotel with decent food and at time longer waits for food service than necessary or acceptable. So why visit Boyne? 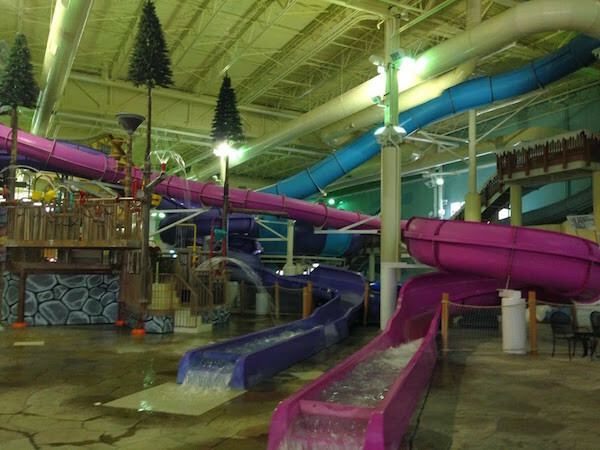 Three reasons: (1) The family atmosphere makes for a relaxing and great vacation; (2) the Boyne Ski Academy is exceptional; and (3) Avalanche Bay, the indoor water park at Boyne Mountain is well priced and incredibly fun. Put the three together and you have a vacation you and the kids won’t forget for a long time. As a mom who travels alone most of the time, I have become accustom to travelling to resorts and only meeting a few people, lots of kids and the staff. Things were very different this time at Boyne. During Canadian Ski Week, most of the skiers are Canadian. I would have guessed that the resort was at least 90% full of Canadians coming from Northern Ontario, the Windsor area and the GTA. The vibe in the hotel was incredible. As I pulled in, all walks of people offered to help me unload my van and welcomed us to the hotel. The halls were filled with excited children who immediately made friends with Will and Charlie and instantly I knew this would be a good week. During our daily swim, girls ages 12-14 would rush over to the kids and help them swim and play with them. A group of boys arrived at our door nightly to offer to take Will down to the arcade and play hockey with him in the hallways. It truly was the most inclusive group of children I have ever met and their parents should be proud to be raising such amazing kids. As for the parents, I was invited to numerous dinners, chatted to in the pool and offered to join groups of skiers so I wasn’t alone. The staff of Boyne also realized I was alone. I often found the Guest Services staff rushing over to help me carry skis and on one occasion to carry an exhausted Charlie back to our room. At night, the lobbies were filled with card playing and singing. We truly have never experienced this welcoming of an atmosphere in all our travels. 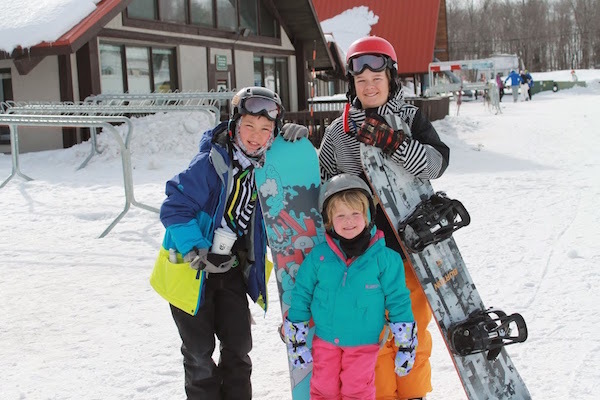 During the day, the kids attended the Boyne Ski Academy which offers snowboarding and skiing lessons to kids and adults. During Canadian Ski Week, adult lessons are included in the ski package. On Day 1, there is a ski-off and kids are placed in groups based on ability. Will and Charlie had never skied so they began on the tiny hill next to the hotel. We were greeted by wonderful instructors, Priscilla, Sarah and Megan, who quickly popped the kids onto their skis and ushered me away. The instructors clearly know what they are doing with this age group and not once during the entire week did I hear from them with a problem. The morning lessons for all kids begin at 9:45 am and run until 11:45 am. The kids then break for lunch and activities which include crafts, downtime and if the kids are old enough a chance to go tubing. Afternoon lessons run from 2:30 pm until 4:30 pm. I stopped by during lunch on the first day to see if the kids wanted to come back to the room and Charlie began crying and begged me to leave her at ski school. After that, I knew they were hooked. When the kids came back from skiing, they were exhausted. Our nights were filled with easy dinners and early bed times. They woke up excited to head back out on the hill and were devastated when the week ended. 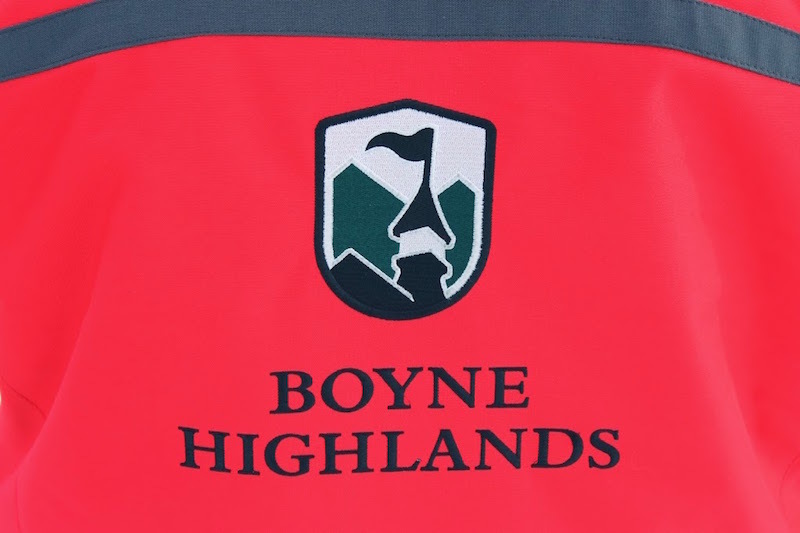 The Ski Schools at Boyne Highlands and Mountain are run by two Austrians, Tony and Wolfgang. They are both incredibly approachable people who visibly care about the schools they are running. I spoke to Tony throughout the week at the Highlands and really got the sense that the ski school was something he was passionate about. 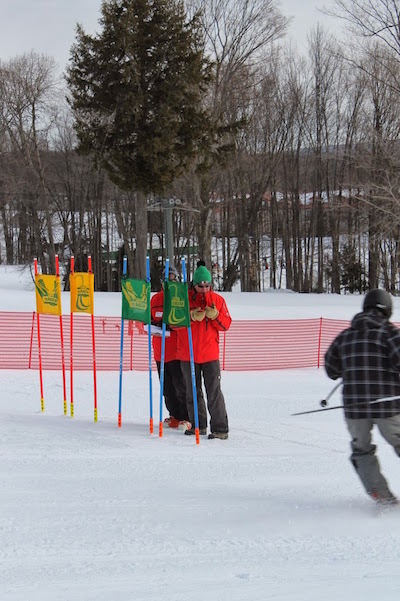 On the last day of ski school, every student gets to participate in Race Day and as I watched Tony stand in frigid temperatures for most of the day to time almost every skier who went by, I understood that he wasn’t just supervising instructors, he was ensuring every skier in the school had as great of an experience as we did. On Race Day, the vibe in the hotel was electric. Parents picked meeting spots and exchanged their kids race times so that each child could have a huge cheering squad. Being alone with my kids, I worried that they would be sad with just me cheering them on. I was touched to see that as the bigger kids races ended on the larger hill, parents and children alike trickled down to the bottom of the hill to cheer on the tiniest of skiers. Later that day at the awards ceremony, Will placed first in his category, quite a feat for my not-so-athletic 5 year old, and the cheers from the crowd made him feel like he had won a gold medal at the Olympics. 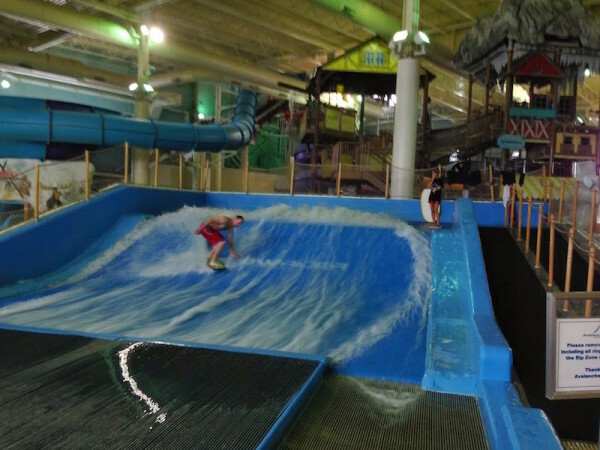 I knew I couldn’t visit Boyne without checking out the much talked about indoor waterpark Avalanche Bay. We arrived early Friday morning to a completely empty waterpark. As you would expect, the waterpark has a winter ski theme. The centre of the park is Splasherhorn Mountain which houses a water playground, two sizeable slides for younger kids and pours down an 800 gallon water avalanche every 20 or so minutes. There is also a kid’s pool, lazy river, various hot tubs, and 4 larger slides. My favourite was the Big Couloir which begins when you enter a capsule and listen to a loud heartbeat. The bottom of the capsule then drops out and you travel up to 38 feet per second in a 360 degree loop. Avalanche Bay is well staffed and the lifeguards were great with kids. I spent a lot of time noticing how attentive they were and never felt that my kids were in any danger in the waterpark. The height restrictions at the waterpark are much more lenient than I have seen elsewhere and at 38″tall, Charlie who is 3, could ride every ride except the Big Couloir which requires riders to be 48″ tall. Avalanche Bay is also incredibly clean and fresh towels and life jackets were easy to find. All in all, we had a wonderful time at the waterpark and I would recommend it to anyone visiting the area. The resort offers packages for a family of four to stay on property with 4 waterpark passes starting at $207 US a night. Daily admission cost to the waterpark varies with the season but ranges from $22 for a day pass for children up to $41 for a day pass for adults if not staying on the property. We thoroughly enjoyed our time at Boyne and are planning on returning annually for the foreseeable future. There are definitely closer ski hills but the kids and I truly loved the Boyne Ski Academy and the vibe at our resort. We stayed at Boyne Highlands for 5 days and 5 nights and ate every meal on site. 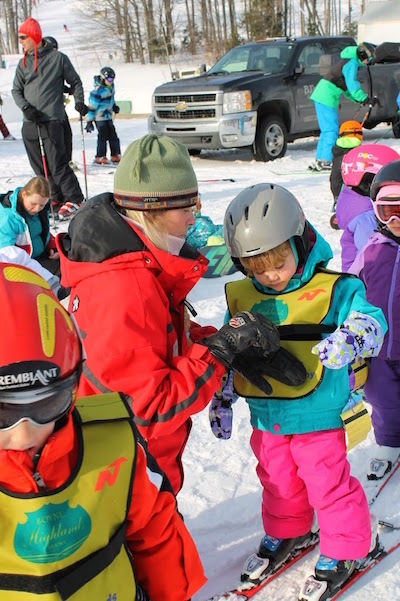 The kids attended ski school for 4 day-long lessons and we all were given a 6-day lift pass. We all also rented skis from the resort. The total cost of the vacation was approximately $1800 Canadian which is a price I don’t think can be beat. As an added bonus, if you visit Boyne during Canadian Ski Week, the total cost of your vacation is priced in Canadian dollars instead of US dollars which saved us a little over $300 for the week. When planning next year’s march break or a summer golf vacation, I would highly recommend looking into the Boyne family of properties.